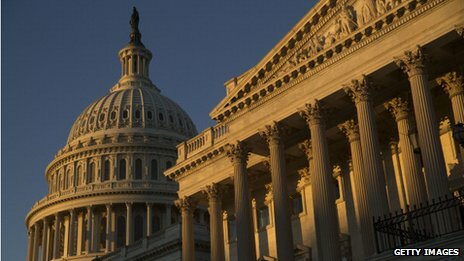 A budget bill has passed a US Senate procedural vote, all but guaranteeing its approval this week and lowering the threat of a fresh government shutdown. In a rare show of cross-party spirit, 12 Republicans joined Democrats to pass the measure 67-33, paving the way for a majority vote later this week. The two-year budget bill was overwhelmingly approved last week by the US House of Representatives. President Barack Obama has also backed the budget proposal. Tuesday’s vote exceeded the 60 votes required to overcome a delaying tactic known as a filibuster. It is expected to come up for a simple majority vote by Wednesday. The Senate’s top four Republican leaders – who are in the minority – voted to block consideration of the budget bill, though their opposition was mainly symbolic and they knew the bill would ultimately go forward, analysts say. If approved, it will go to Mr Obama for his signature. The proposal was drafted by a cross-party budget committee convened after a 16-day government shutdown in October. 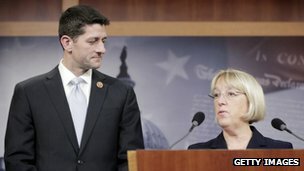 “This bipartisan bill takes the first steps toward rebuilding our broken budget process,” Democratic Senator Patty Murray, co-writer of the bill, said. But the Senate’s top Republican said on Tuesday he doubts those in his own party will allow a crucial increase on the nation’s debt limit in 2014 unless new conditions are added, suggesting his party would demand budget cuts. “I doubt if the House, or for that matter the Senate, is willing to give the president a clean debt ceiling increase,” Senate Minority Leader Mitch McConnell told reporters. Government officials say the deal, which sets discretionary defence and domestic spending at $1 trillion (£610bn) for the current fiscal year, aims to shave up to $23bn from the nation’s $642bn annual budget deficit. It also rolls back $63bn in military and domestic spending cuts automatically imposed in January when Democrats and Republicans failed to reach a budget compromise. The new deal does not raise taxes but requires newly hired federal workers to make larger contributions to their pensions. Republican Congressman Paul Ryan, chair of the House budget committee, said last week the budget deal “cuts spending in a smarter way”. It also helps avoid another government shutdown on 15 January when government funding would otherwise to run out. The October partial government shutdown – which halted many federal services across the country – is said to have cost the US economy $24bn, as projected by financial services company Standard & Poor’s.